After loving the no-cook chickpea salad I made a several days back, I decided to give making a raw salad another shot, but this time throwing in some whole grains! For dinner, I made a very savory quinoa salad that is packed with over 5 servings of daily vegetables per serving size and is full of colorful vitamins and nutrients. The best part, in my opinion, was that I didn’t really need much dressing to make it taste good. It sort of all came together on it’s own and all of the guests I served the salad too agreed with me. The salad has sort of a creamy texture because of the finely chopped broccoli and spinach leaves, but not creamy to the point of cheesy-creamy. The reason why I say creamy is because the combination of broccoli and spinach really brings life to the salad and removes the need for much, if any, oil and/or dressing. Hence, I say “creamy” 🙂 Now, most people may not like the thought of a creamy salad. As my mom’s friend who tried this salad said, “no one wants to have a salad that tastes like baby food”. Well, this salad wasn’t like that. The freshly chopped vegetables and the deliciously sweet apple gave the salad some crunch and the lemon juice really brought together all of the tastes to make a nice lemon zesty summer salad. It’s a perfect blend, really, and was definitely filling and satisfying! 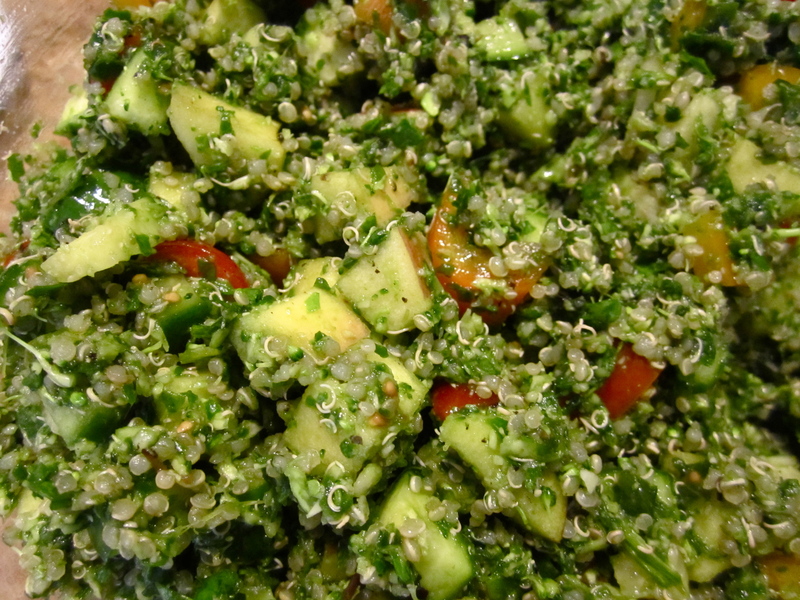 You can serve this quinoa salad as a main dish, a side dish, or an appetizer – it’s really flexible and you can even add or remove ingredients depending on the taste preferences of your audience. Enjoy! 1. Cook your quinoa in some water on the stovetop. I place the seaweed in with the quinoa. 2. Chop or grind the spinach leaves and broccoli in a blender. I did mine in parts since my grinder is small. 3. 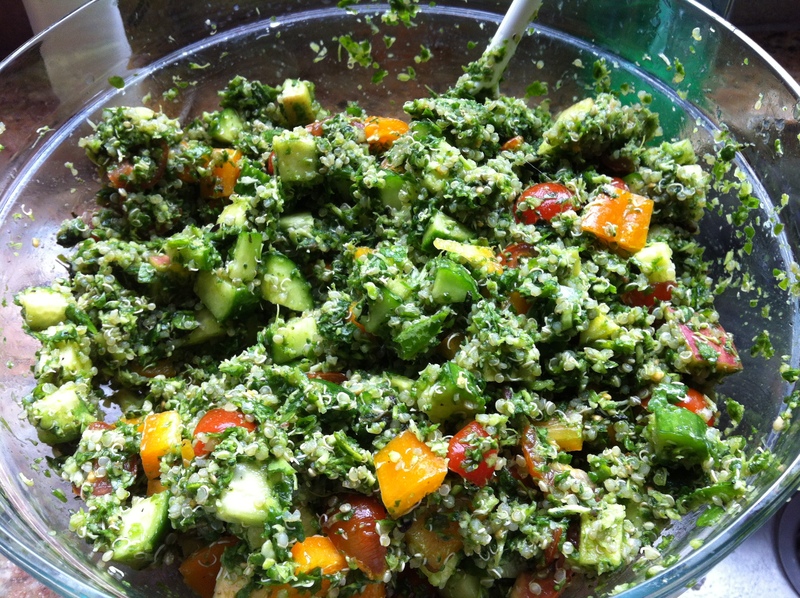 Toss together the quinoa, finely chopped spinach and broccoli, the rest of the diced vegetables, and the basil leaves. Top with the fresh lemon juice and black pepper. Add the olive oil and salt depending on your personal taste. Toss everything together evenly and serve.